The logistical support UAV is a project created to fill holes in the military supply chain. The projects goal was to experiment and participate in a feasibility study and conceptual and preliminary design of an existing problem. Carrying capability of a 50 Kg payload in a radius of 10 Km and back. VTOL (Vertical Take-Off and Landing) capability. High reliability: the UAV will be able to continue flight during any first malfunction. These requirements shaped the decision making process and the final result achieved. At the beginning of the project a couple of possible conceptual configurations were examined, with regard to client requirements and engineering demands. Eventually the selected configuration was of an Octocopter, which has 8 electrical motor each on a different armature around a concentric C.G. The UAVs operational nature dictated varied design and operational requirements, the first of which was for the UAV to be transferable by a private vehicle. As a result, a quick-and-easy assembly mechanism was design. Additionally, as it is an aerial system, matters of weight and aerodynamics were resolved while offering a sufficient structural S.F. for flight and landing scenarios with a load factor of 3. For the structure, light-weight metals and composite materials were used, while emphasizing manufacturing simplicity and easy assembly. A 3D model was built using SolidWorks software. This model was used for static and dynamic structural analysis. Through this model the inertia tensor and actual C.G were computed, for the use of the control model and performance evaluation. Because this configuration is inherently unstable, emphasis was placed on control and stability of the UAV. 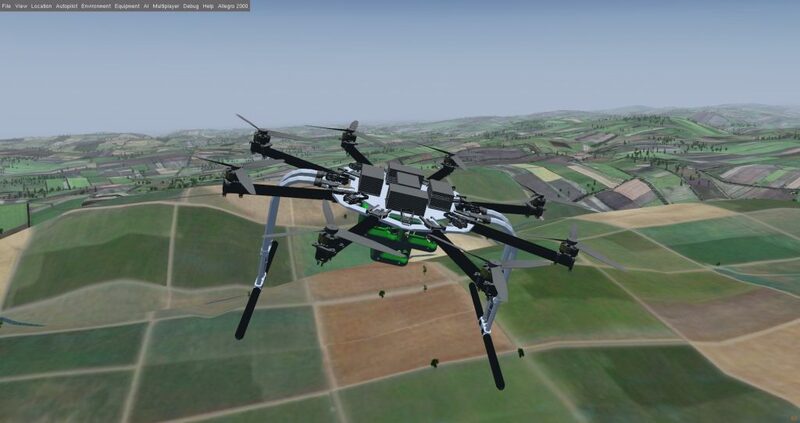 Work done in this field includes building a 6 DOF octocopter comprehensive model, introduction of strict control and stability laws, an autopilot and more features to ensure operational reliability. To get an accurate simulation, in-depth work has been done in the field of aerodynamics. From choosing the right motors and required thrust ranges to propeller size. Extensive simulations were made on the chosen propeller blade (using RaPiD software, by prof. Omri Rand), resulting in 4D maps containing exact forces and moments for every flight configuration (dependent on AOA, altitude, blade RPM and flight velocity). The end result is a UAV system that meets the requirements, and even extended to carry more payloads (up to 80 Kg) on the expanse of flight radius. The Logistic support UAV is completely autonomous from takeoff to landing, and as such frees the operator and field soldiers to which is provides support, increasing operational awareness and saving lives.